All our coaches have attended and obtained a minimum FA 1st 4 Sport Level 1 Coaching Course. A child protection officer and qualified first aider are always available at training sessions. Our training sessions run for 1hr. Start times are from 7pm every Wednesday. Our training sessions are held at The Victory Academy, Magpie Hall Road, Chatham. ME4 5JB. A car park is available just up from the Academy, no vehicles are permitted on the grounds. The 1st two training sessions are free of charge, then a fee of £3.00 per session is required. This does not include match fees. Please make sure that your daughter has with them suitable foot wear. Football boots are recommended for 3G surface. Our club rules state that shin pads must be worn to all training sessions. We also like the girls to bring a drink with them (not fizzy please) Club rules also state that jewels must be removed. Under no circumstances are mobile telephones allowed in the training area. Either leave your mobile at home or ask a parent to look after it. Meridian Girls will not be held responsible for any breakages or loses. Most committee members will have a phone in case of emergencies. 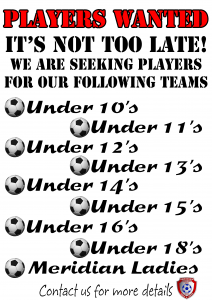 If any of the above information is unclear, please do not hesitate in contacting our club secretary. You can also find out more by visiting our FAQ pages.